Best Propane Delivery In Guilford Connecticut. Low Prices, Fast & Reliable Fuel Delivery. 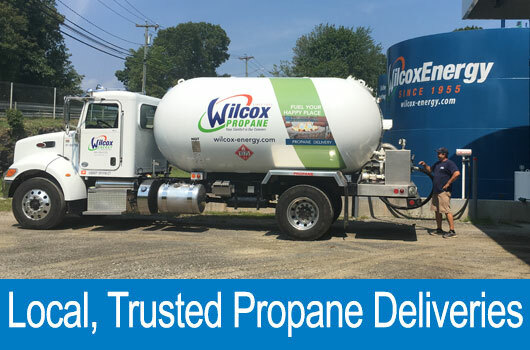 Wilcox Energy is proud to offer propane delivery services to residential and commercial properties right here in Guilford, Connecticut. We are not a propane company, we are a customer service company. Our focus is all about our customers! For high-quality services at affordable prices, be sure to contact Wilcox Energy. Our propane delivery drivers are ready to fulfill all of your propane requirements. This includes routine propane tank refills as well as emergency fuel deliveries. When you need new propane tanks installed, the experts at Wilcox Energy can get the job done. We service both homes and businesses throughout the Guilford, CT 06437 area. We have the skills required to keep your home or office warm and comfortable without breaking your bank account. Make this winter your most affordable and comfortable one yet, with the help of Wilcox Energy. There is very little compared to the discomfort of having to deal with a cold home in the middle of winter. This is especially true when the reason your home is cold is due to running out of propane. Thankfully, when you notice that your tank is getting low, you can count on Wilcox Energy to fill your tanks. We service homes and business right here in Guilford, CT. Our propane services are reliable and trustworthy. When you need a propane delivery, be sure to Call Wilcox Energy, your local fuel supplier in Guilford, CT! Even when supply and demand for propane is high, you can count on Wilcox Energy to provide you with the propane that you need. We have a propane storage depot to ensure that our supplies are high even in the coldest times of the winter. You will not have to face a fuel shortage with us. Our service area is about 20 miles from our main office which is quite small when compared to other propane fuel suppliers. Your propane delivery to Guilford, CT will be fast and when you need it the most. We are located on the southern shores of Connecticut which makes us centrally located inside of our service area. Also, we have service locations directly in Guilford, making our Propane Deliveries and Home Heating Oil Deliveries that much faster. Running low on fuel? Be sure to take advantage of our prompt 24 Hour Emergency Service. Don’t deal with a cold house in the middle of winter. Instead, give us a call and we’ll take care of you right away. Even if your propane tank is full but your heater is giving you issues, you can count on Wilcox Energy. We offer HVAC services for ailing heating systems. We specialize in repairs, maintenance, and new installs on all makes and models of HVAC equipment. We also service propane water heaters, fireplaces, and pool heating systems. Connecticut winters require heating but the summers also require air conditioning. If your air conditioner needs to be serviced, such requiring maintenance or repair, we have highly trained NATE certified contractors at your service. Need a new AC unit? We can install a new cooling system in your Guilford, CT home or business. Choosing the best propane supplier for your home or office can be a daunting task. Rest assured that when you hire us, you will be working with the best in the industry. Our staff is professional, knowledgeable, and friendly. Let us answer any HVAC or fuel related questions that you might have. It is common for homeowners and business owners to shop for the best Propane Prices In Guilford CT. However, Wilcox Energy can assure you that we have the best prices available. However, it should be noted that propane prices do fluctuate because of weather, fuel conditions and much more. For this reason, be sure to give us a call to find out today’s propane prices. Call (860) 399-6218. Guilford, Connecticut was settled by the Europeans in 1639 after being purchased from the Native Americans. This historic town was named after Guildford, England, but the name is spelled slightly different. Guilford is home to the oldest town in Connecticut, the Henry Whitfield House, which was constructed in 1639. Guilford is along the southern coast of Connecticut and has been listed in Money magazines top 100 towns to live in. Guilford has a median household income that is way above the average american household income of around $50,000. The average household income for Guilford is $97,183. This shows how desirable Guilford is to live in, considering the household income is nearly double the American average, and still has a population of over 22,000 people. The median home value is Guilford was 230,500 in 2000, and has increased to $387,177. This is significant considering the recession in the late 2000’s kept most Americans home value over the past 15 years the same.